For A-level candidates, there are hiring opportunities everywhere. They keep getting messages on LinkedIn, and even if they have accepted your offer, that doesn't necessarily mean they have declined to others. 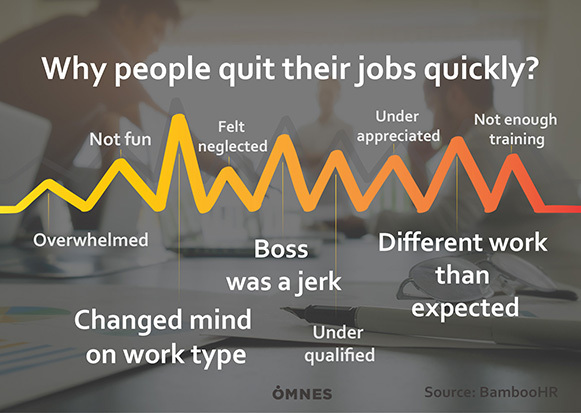 Moreover, researches are telling us that one third of newly hired employees are still job hunting during the first six months, or even less. Some of these people think that it’s better to leave before they get too engaged. That’s why you have to engage them before they even realize it. New hires have to feel properly welcome and appreciated. Turnover rate is a percentage of employees who leave an organization during a certain period. People usually measure it monthly and annually, but they don’t include internal movements like promotions or transfers. Seeing a spike in your company's turnover will probably cause a spike in your blood pressure. So, in order to realize if you have a problem, let’s see numbers first. Here’s the formula for annual turnover rate: Since we are talking about the first year of engagement, it’s essential to measure new hire turnover rate. Let’s find out how many employees left your company within their first year on the job. Different industries have different expected turnover rates. The average turnover rate for all employment is 3.5 percent. All these things matters. The fact is that the onboarding doesn’t end after day one. You have to think about small things in order to make your team strong. Maybe you didn’t make the right choice in the first place by hiring the wrong person. If that is a case, you can always rely on an IT recruitment company to help you to find the most suitable person for a job. However, your job is to make onboarding process work, so you should conduct more comprehensive studies on trends in your workforce and induce a positive change. 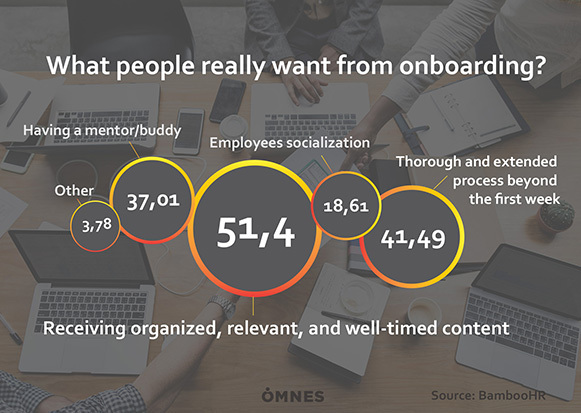 [caption id="attachment_480" align="aligncenter" width="500"] You have to understand your employees needs in order to keep them[/caption] Learn more about onboarding: Tips for a better onboarding process to improve new hire satisfaction. What are the steps in recruitment (the process)? Finding an employee is not just a random process. It takes time and patience to find a right person for the job that believes in the company's culture and has the skills to do the job well. Companies don’t want to waste their time on a wrong person, so they hire a professional to find an employee that fits the best in the company. So, if you ever went through the recruitment process, you know that there are a few steps that will lead you to actually getting a job. What is actually the recruitment process? A recruitment process is an important part of human resource management (HRM) that isn’t done without proper strategic planning. Although every organization or company has a goal to find the perfect person for the job, they can have a different approach to this process. Every organization and company is different, so what works well for one company may not work well for other. That’s why every hiring process is different and the person whose job is to find the best candidate has to be insightful. One of the biggest prejudices about this job is that you have to just submit a position to online job posting boards and waiting for the applications to roll in. Not every A-level candidate is actively looking for a job, so recruiter should also approach people who already have a job. Further, they have to identify, recruit, interview, hire, and retain the best candidates available in the marketplace. So, let’s dig deeper into the recruitment process. This steps will help you understand why you have to go through all these interview and tests when applying for a job. Whether somebody just left a job and a company needs a replacement, or they want to open a new job position, a recruiter has to know what the company really needs from a candidate. That means that a recruiter has to prepare the complete job description that includes both hard skills and soft skills. Nevertheless, they can’t just copy the description that was made before the last employee left. IT recruitment agency has to update it and put all responsibilities needed for the job. A clear job description will enable candidates to understand what is required of them and motivate them to apply. Once a recruiter is done with identifying the hiring needs, they plan the process - how many people will they call, which communication channels will be used, how will they approach to people, etc. Preparation is the key to success and it will make recruitment much easier. The plan will save both IT recruitment agencies and candidates time. Companies usually share a job application on all social media platforms they have and advertise it, but they shouldn’t wait for candidates to approach them. Sure, maybe the perfect candidate will apply, but the recruiter has to “hunt” for high-level A-players by using other channels. Perfect candidates aren’t going to rain down from the sky, so companies should try to find them on LinkedIn, social media groups, or even ask someone for a recommendation. As you can see, there is a reason why people call recruiters “headhunters”. It’s time to identify and recruit candidates that match a company’s needs the best! Good candidates should quickly and clearly highlight if a recruiter follows the job description. However, companies should sell the story about the company and convince candidates that this job is a great opportunity for them. Top IT professionals are not interested only in the job, but the company itself. The company culture could be the turning point for them. However, recruiters should inform all applicants about the status of the application, whether they got to the next step or not. For some companies, the next stage is to send a test to top candidates and see if they were telling a truth in a resume. For others, the next step is an interview. A test can help companies find A-level candidates and see if they are able to get the job done well and fast. Usually, you have a limited time to finish the test, but this is the opportunity for you to see what you know, and what skills you should develop. After testing, companies will have a much shorter list of candidates that will get to the next stage of the recruitment process - the interview. When it comes to the interview, it’s important for both recruiter and candidate to be prepared. This is a moment when companies should find out more about the applicant’s background, skills, and even personality to see if they fit with your company’s culture. Recruiters should make a list of information they need in order to make the interview session much more structured. However, this is not a one-way conversation because A-level candidates want more than just a job. They want to find out more about the company, so the recruiter job is to sell a story, tell them about benefits they’ll get if they start working for them. Nevertheless, if the interview last too long, top candidates can lose interest in the company. A candidate may be interviewing with more than one organization, so the recruiter has to inform them where they are in the process and what to expect in the near term. Hiring the wrong person can be extremely costly, so recruiters have to double check all references and other information they have about the chosen candidate. The offer stage is one of the most delicate stages of the recruiting process and IT recruitment companies should never take for granted that a candidate is going to accept an offer. However, if they’ve done all of the proper work beforehand, everything should go well. Sometimes, they will have to extend the offer, so if they are sure that they’ve found the right person for the job, the company should satisfy the candidate’s expectations. In the best case, the candidate will accept an offer and take a job. However, they may reject it so IT staffing agency will have to offer a job to the next candidate on the list. Once they find the candidate that is satisfied with the salary, start date, and other terms and conditions of employment that are based on the agreement between the company and the candidate, they can sign the papers. Once a candidate does accept the offer of employment, and the official hiring is done, HR department should prepare the onboarding process that includes a welcome session, shadowing for a period of time, and a follow-up. The chosen candidate should feel wanted before they officially join the organization, and HR should also check them from time to time in order to see if they are satisfied with the job, company and team members. Remember, the goal of every company is to retain this employee. The recruitment process is an opportunity for you to see what you know and what skills you have to improve, so don’t be disappointed if something goes wrong. It’s important to look at every job opportunity like it’s the only one - you have to adapt a resume and motivation letter to the particular company. You can see what they need from a job application and their website so you can underline the skills and experience they need in your resume. These steps will help you understand how IT staffing agencies work and prepare you for the next step, but remember that every company is different. Going through a recruitment process over and over again can be stressful and exhausting, so make sure that you’ve done all of the proper work beforehand. Maybe the next job offer is perfect for you, so good luck! Are you ready to become an IT recruiter? Finding an IT professional that fits the best in a team and has required skills isn’t an easy task. There are many people who present themselves in CV different than they really are. Some of them overestimate themselves, while others do the opposite, so a job of a recruiter is to find out a truth about a candidate. There is one thing that distinguishes a great recruiter from a good one - an attention to details. This job requires more than finding names, emails, LinkedIn profiles, etc. So, if you’re still interested in becoming a recruiter, let’s find out what you can do to become one. People sometimes call recruiters “headhunters” for a reason - they are usually a human resources (HR) professionals whose job is to identify and pursue candidates for potential job openings. Once an individual expresses interest and enters the application process, recruiters job is to check if a candidate has all requirements and qualifications for a job, but also to see if they fit to a company’s culture. This is the first, initial stage of assessment, so if the candidate passes it, recruiters will arrange an interview between the job candidate and key staff within the client company. As you can see, the IT recruiter is a connection between a company and a candidate, so their job will continue after the second stage, whether they decide to make an offer to a candidate or not. They negotiation over salary and other benefits, or inform candidates that they didn’t get a job. You may work as an in-house recruiter or a company can hire you when needed. Either way, this is a surprisingly fulfilling job that you can feel proud of each day, and the salary is not bad at all. Nevertheless, as IT recruiter you will have to understand the nature of the job they are hiring for so you may need IT skills as well. Recruiters are not career counselors Recruiters aren’t mind readers, so it’s not their job to look at a resume and immediately understand where a candidate would fit into their organization or to suggest which career path they should choose. That’s why candidates sometimes have to go through few stages of interviews. Also, candidates job is to know what they want and what is their goal. Recruiter job is to find good candidates, and they try to keep the process flowing smoothly. Not all employers will require a degree, but it could enhance your marketability in the competitive job market. It’s also possible to switch from programming to IT recruiter because it’s very helpful to have knowledge about informational technologies. Why? Well, to understand why a company wants to hire a front-end developer with an experience in React, you will need to have some knowledge of this field. Nevertheless, everything is possible if you’re willing to work hard to become a recruiter. As you know, your job is to find talent but to do so, you have to be talented, too. Further, you will need both technical and non-technical skills to become a recruiter. Soft skills are very important because you will work with people all time. As you need to fully understand clients and candidates needs, you have to be able to listen actively, as well as to make decisions and solve problems quickly. Next, strong written and verbal communication skills are also a must, along with negotiation skills and well use of time management. When it comes to technical skills, there are some basics that you have to understand, such as computer and internet skills. Nevertheless, you may need a medium understanding of SEO and social media as well. Moreover, most IT recruiters have acquired the technical expertise and knowledge in order to fully understand the nature of the jobs they are hiring for. Because of the advent of technology, you may have to learn something new every day, even if you’re established recruiter. If you start an internship while you’re still in a college, it will be easier for you to find a job when you get your degree. Any past experience matters. For example, if you had worked in customer service department, it can show employers that you have the interpersonal skills, which are important for this position. Some recruiter agencies require direct experience working in HR, some not, but you have to show them that you’re able to adapt to a new position. You have to be willing to continue your education, to finish some courses and learn from others. While you’re still learning, it’s a good idea to connect with other professionals from this field. Social media platforms are great for that - you can join a group on Facebook, connect with other recruiters on LinkedIn, or find some meetups where you can talk with both starters and established professionals from the field in person. Moreover, you can join the Society for Human Resource Management(SHRM). This is a good choice for many reasons. Firstly, they offer a number of professional certifications to boost your resume. Secondly, they will show prospective employers that you’re serious about your recruiting career, not to mention all the connections you will make. Who knows, you may get a job if you continue spreading the voice about your work. It’s time to put your skills and knowledge in use. The thing is that you can have all the qualifications in the world, but if you don’t make placements, a recruiter agency will fire you. On the other side, if you don’t have experience or all skills for becoming one, but you’re passionate about a job and have good recruiting metrics, they will definitely keep you. For many people becoming a recruiter is a starting point for many different career paths such as HR leader. To become one, you will have to get experience in performance management, organizational development, employee engagement, succession planning, and personnel management. Don’t hesitate to dream about next step in your career, because it can motivate you to do more. Can you imagine yourself working as a recruiter? If it drives your passion and if you find it fulfilling to know that you can help people find a job every day, you’re on the right path in your career and life. Yes, there will be many challenges, but you should enjoy them. You’re working in a competitive space, so keep learning and do everything you can to understand the industry and to stay up to date. Read reports, follow influencers, go to courses, and connect with other professionals from the industry. Throughout your career, keep asking yourself the question “How to get better at recruitment?” and remember why did you start in the first place. Enjoy this journey because your work makes a significant difference in the lives of others. So many established developers are already getting people’s attention online, so why should you even try to get out there? Well, because you can and because it will help you in so many ways. For example, you will rank better on Google, so when potential clients search your name, they will find your work quickly. Next, you will get noticed! Having a discussion with other professionals can help you learn and find a job opportunity that’s the best for you. That’s why having a blog and online portfolio is essential in IT world. Moreover, an online presence is a must-have thing for a developer because you’re building your personal brand. So, let’s start branding! Why and how to start blogging? Blogging is freeing experience - you can use it as a way to show your personality and interests outside of code. Still, coding is the priority, so you should start writing about programming even though you’re not an expert. Write about your learning process, what did you try and what had worked the best for you. You know some useful websites or tools? Write about it! Go outside your comfort zone and start typing. Creating a blog is simple and it doesn’t have to be flashy or expensive - you can use a Wordpress blog with a free theme, or you can write on platforms such as Medium or Jekyll. As this may be your first blog, the important thing is not to overthink. Just write about topics that inspire you, because the most crucial thing is that IT recruitment agencies and like-minded people can actually find you online, see what you’re about and contact you if needed. Another goal is to document your learnings that will be useful for both you and your audience. Don’t try to sound too smart and to share advice about topics you’re not familiar with. You’re just starting your developer career, so don’t act like you know everything. Further, a blog will help you connect with people and discuss things that are trending in the industry. So, when you use new technologies, you will have someone to ask for help or advice. This may be the most awesome benefit of blogging - connecting with strangers you have something in common. Let’s be honest, you can’t talk about coding with everyone, so chatting with these people may be relaxing for you. There are few things you should consider before starting a blog. Firstly, pick a blog name carefully. This is something you can’t just change. A blog name should set the tone of your blog, and tell people what you’re actually writing about. This also refers to your web address. Secondly, you have to think about the visual identity of your blog. Determine your blog’s color palette and keep this identity on social media platforms, too. You are creating your blog’s personality, so you have to think about details. When it comes to your writing style, you have to sound like a human while writing, so you have to inject a bit of your personality into your content. Standing out from others is not a simple task. Your style and authenticity are the things that will attract people, so they will keep coming to see what’s new on your blog. It’s important to stay consistent to your blog voice and to post regularly. Choose the most respectful form of yourself and your passions because it’s hard to remove and forget what’s done in the online world. People are judgemental, so don’t let them turn you into a crabby person. Think twice before you post, and keep it respectful. GitHub can help you show your best work in developers community, as long as you tidy up your account regularly. You can highlight your most elegant code and projects you’re proud of but you can also learn from other developers. Moreover, this is the best way to present yourself to IT recruitment companies. You may have a number of skills written in your CV, but recruiter can check on GitHub if you’re lying about it. Your code will tell them more about your work then your CV. That’s why you have to make sure that your account is not messy and half-finished. Update account regularly and delete projects that you don’t have the intention to finish. Here is a piece of advice - update account regularly and delete projects that you don’t have the intention to finish. Push code for both big and small projects. Don’t underestimate small projects because they can show that you have initiative and passion to develop in the field. Your account should present you as a compelling candidate, so don’t let IT staffing agency reject you before even hear from you. Are you credible to write about coding? You have to give people evidence of your accomplishments so they can believe you. Give them first-hand evidence - pictures, links, references, publications, etc. A list of your skills is simply not enough. You have to organize and update your portfolio, add insights into the technologies you’ve learned and into the problems you’ve solved. Moreover, you can add your blog to your portfolio, so people will see how passionate you are about coding. 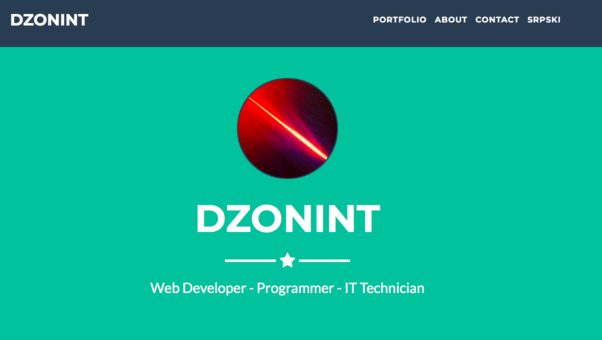 [caption id="attachment_319" align="alignleft" width="602"] Credits: https://dzonint.github.io[/caption] Everyone should make a portfolio, especially front-end developers and UX designers. If you’re one of them, established websites such as dribbble or Behance can help you get inspired and heard by other professionals. You may not be much of a social media person, but you have to make an effort to present yourself at your best. LinkedIn is a must-have in developers world, but Twitter will also help you build an online presence. A recruitment agency that has a perfect job for you may find you on LinkedIn, while on Twitter you can connect and actually discuss some topic with most prestigious CEOs. Both social media platforms can help you stay up to date and see what’s trending in the industry. 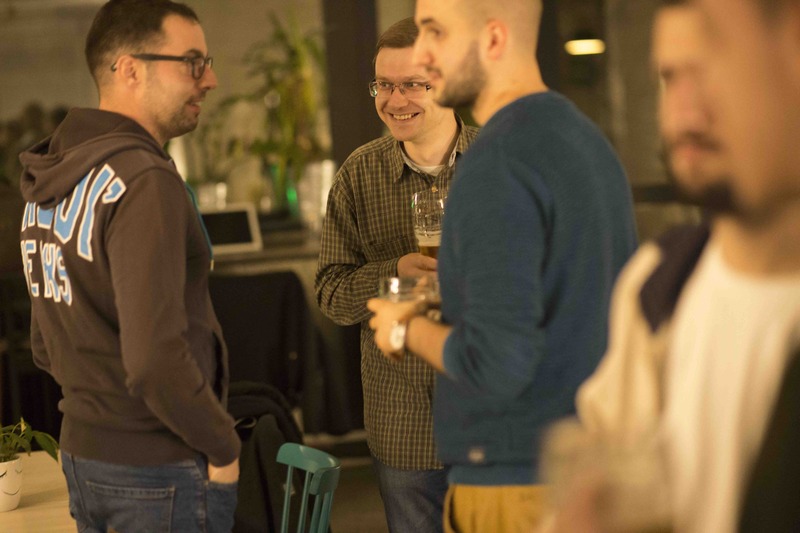 You can even find out some interesting events and meetups that will help you connect with people in person (Meetup is also a great place to find events for developers in your area). However, you have to watch out for mistakes! Your posts can see everyone, so make sure that you’re decent, kind, but also interesting and unique. Photos of your meal or inappropriate jokes are a no-no in the professional world. You are branding yourself, so you have to give people some kind of value. There is a thin line between being cool and unprofessional. As you can see, you have a choice, so try to present yourself as an intelligent, ambitious team player. Remember, your reputation is important, so don’t let an inappropriate post damages it. It takes time to brand yourself, so you probably won’t have many visitors on the blog at first. Remember, you’re doing it for yourself, so if you’re consistent and devoted to your work, people will keep coming. Start small - share your post with your friends and colleagues. Ask them for feedback, so you can improve your content. After that, you can share your posts on forums or even websites such as Reddit or Hacker News. Nevertheless, once you establish yourself as a blogger, you may have to deal with criticism. Don’t let this kill your enthusiasm for writing and remember your goals in these situations - you want to learn more by writing, to connect with like-minded people and boost your online presence. Also, social media platforms can also help you boost your blog traffic and expand your audience. Make sure that your content is catchy, so people will like, share and comment your posts. Yes, having passion and experience is the best combination, but you’ll get there. Passionate people learn quickly, enjoy their work and don’t give up after the first obstacle. Don’t underestimate an online presence because it can help you connect with many professionals and IT recruiters that will help you boost your career and establish yourself as a credible developer. Stay consistent, get up and code! Interviews have become inevitable parts of hiring process in basically every domain nowadays. When it comes to tech oriented companies and IT experts, this whole hiring process usually consists in two separate types of question sections. Recruiting and staffing companies or HR departments and in-house HR managers often represent the initial part of this procedure. There’s more to recruitment than checking out LinkedIn profiles, collecting CV’s and making developers count tennis balls in an imaginary school bus. These interviews should be carefully prepared with the idea to provide and collect all of the relevant information – from and to both ends. Both sides are entitled to be properly introduced to each other and that makes this hiring chapter significant. There are a few pretty simple rules that can be applied to various situations and sections of daily working life, and everyone seems to be forgetting about those rules every now and then. These seemingly small gestures and tiny inadequacies can make a big impact sometimes, especially if they coincide with a job interview. Before a candidate officially arrives to the interview, some emailing is unavoidable – there must be at least a brief invite and confirmation involved. Someone might be in a hurry or someone might lack the concentration for only a moment, and it’s when Murphy’s Law kicks in and creates cringe worthy texts. IT recruiters have a lot on their hands and on their minds. It’s easy to make a simple mistake and send out a wrong message. One of the most common mistakes is typing in a wrong name. There are numerous reasons for this to happen and it can actually be perfectly understandable in some, if not the majority of cases. But the cold harsh fact is that if a recruiter makes this sort of a mistake, there’s an insanely high percent of chance that a developer will rather change his name than agree to change his job. And yes, this addressing malfunction is usually presumed as a typical copy-paste syndrome and recruiters can be scolded to infinity and beyond when something like this occurs. But it’s a two way street and this goes out for everyone: Dear Recruiters and other tech and non-tech people, double check your texts before sending them. It’s cool to take a moment and make sure you’ve got everything right. This double checking also implies typos and similar errors, disastrous products of autocorrect, grammar-nazi-proofing your emails etc. So sit back and take a quick glance at what you wrote. Once you’ve said yes to a meeting, make sure to arrive on time. This might easily seem like the most evident fact ever, but it somehow manages to become an obstacle in the most inconvenient moment. Calculate and recalculate the route you’re planning to use. 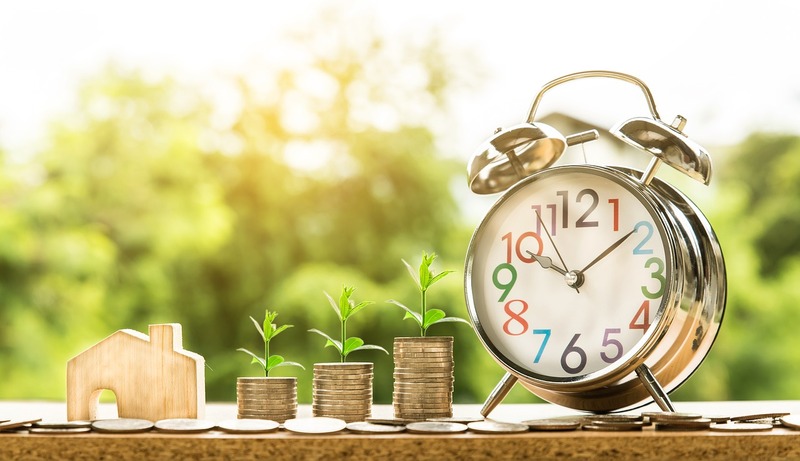 Be careful when scheduling – think of the first step and double check your calendar, reminder, alarm clock, that one colleague that always remembers stuff, notebooks, agendas, or a fortune teller if necessary. Knowing the value of time should be number one on everyone’s list of priorities. Not being able to achieve a goal or fulfil a task successfully within a previously agreed time frame can be interpreted as disrespect. It’s the same with showing up late at an appointment. And if that appointment happens to be a job interview – you’re a very unlikely candidate to be taken seriously. If you’re the person in charge of conducting the interview, well you’re just about equally doomed. Time quotes are related to way too many clichés, but time does need to be treated as one of the most valuable resources. Another variable you should count in when having an interview (or a business meeting) is the appearance. Many IT and Recruiting companies, typically small businesses and small and/or remote staffing companies are about the laid back approach. It means flexibility in more than one aspect, and it surely means casual slash non existing dress code. But meeting a new client, business partner or employee could entail a new set of the rules. Large IT companies or small IT companies with the tendency to appreciate suits and ties can hire (for example) a remote HR team. They might need sourcing or end-to-end recruiting services. And the team they’re looking to hire must fulfill the certain requirements regarding HR solutions and recruiting skills, but to them it’s also important to maintain the certain image. Make no mistake – dressing for the occasion isn’t about the style itself, it’s about showing interest in a company’s culture. It’s being respectful. It’s also a part of necessary background checking. So if you come from the track suit and yoga pants friendly working environment or from a remote job, take a good look at what’s appreciated in the company you’re paying a visit. 4. Did someone say background checking? Each HR manager and IT recruiter should know the importance of assembling facts and information while doing their sourcing sorcery thing. They do need to keep track of literally everything regarding a hiring process – collecting and saving info, keeping colleagues in loop and sharing data. And every tech recruitment agency must have its own system to preserve information and contacts. Recruiters are ought to use all sorts of tools in order to easily find details they need at any given time – documents, spreadsheets, etc. But it’s equally or more important to gather facts in the first place. An HR must be thoroughly prepared for the interview. It does mean to have a good look at the CV, business and social media network profiles of a candidate etc. But it also requires some extra time to look up the company he’s currently working in or the last job he has had. It would raise the right questions and hence lead to relevant answers – the recruiter will actually get to know about the candidate and his goals and values. This kind of approach might give the interview a much needed friendly factor and it would shift its concept from questionnaire-like form to an actual conversation. Which leads us to the next subject. 5. How many golf balls can fit into an angry developer? Well, it’s personal. It’s individual. It’s changeable. It depends on numerous factors. And you, fellow recruiters, should hear all about it. Rather than asking textbook questions let the candidates speak their mind. Be genuine and kind of spontaneous. OK, we need to face one fact – some of those “typical HR questions” are actually a must. No one is particularly impressed by them, but some bits of interviews have their purpose and should be accepted as such – less than fun but more than obligatory. Asking these questions about someone’s actual aspirations and intentions will give a recruiter the insight in what might interest a candidate. And his preferences are mainly not about the new coffee machine or a possibility of beer pong tournament. Tell them about some truly good, and we’re speaking LONG TERM good stuff your client or employee has to offer. Members of remote HR solutions teams or IT recruiting agencies need to go an extra mile in order to become deeply familiar with all of their clients’ requirements and with their goals and plans. And their clients must be aware of this and keep them posted and well informed. These are some fundamental methods and tricks a successful recruitment strategy should consist of. We’d be happy to hear and/or say more about this subject. Let us know what you find significant and let’s do our best to improve hiring process.